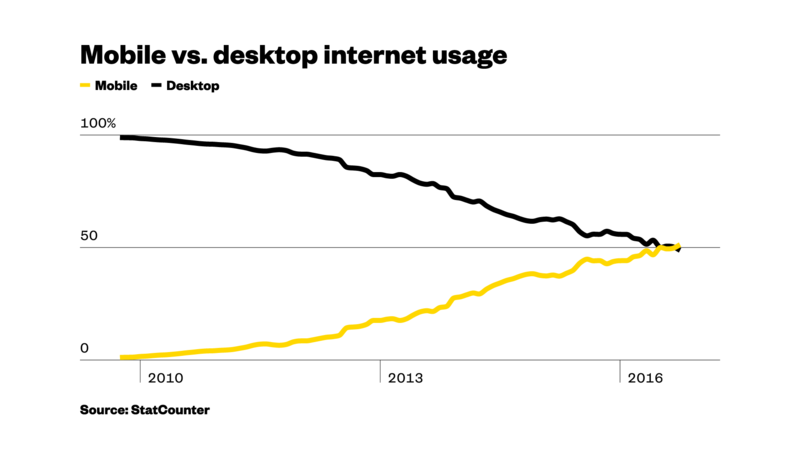 Silicon Valley has spent much of the last decade preparing for a mobile-first world, and it looks like that time has finally come: More people now access the internet from a smartphone than they do from any other device. The web traffic analysis firm StatCounter reported that 51.3 percent of internet users are now on a mobile device, beating out desktop computers for the first time. More evidence of the supremacy of mobile came from Facebook’s earnings report Wednesday, in which the social network reported that 85 percent of its quarterly revenue came from its mobile advertising business — about $5.7 billion. That’s more than all of Facebook made a year ago. Facebook’s rapidly growing mobile business accounts for its stock price more than tripling since the company went public in 2012. More and more people are spending their time looking at smartphones, and most people with smartphones spend a lot of time on Facebook. So if advertisers want to reach a lot of people on mobile, they know they have to go through Facebook. Facebook’s only real competition is Google. On Tuesday, advertising technology executive Jason Kint tweeted out a chart that showed how all the growth in digital advertising was basically split between Google and Facebook. “Everyone else” saw their business shrink by 3 percent. Though there’s some dispute about these figures, the trend is pretty clear: The future is mobile, and mobile is Facebook.